Drabbunnies are unique to the world of Wukrii, and are an ancient species not believed to be native to the Wukrii Islands, though little is known about their origins to be certain. 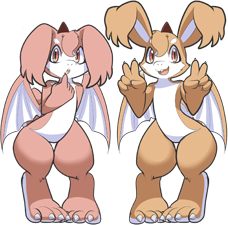 A drabbunny is both a combination of two very old animal species found in the world, rabbits & bunnies, combined with dragons. This unique hybrid species is only seen natively on their own islands, and while they often keep to their own community, many can be found traveling the world, and are often known for their entrepreneurial spirit. 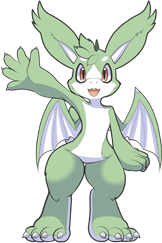 Drabbunnies can be either full sized but with small wings, or diminutive and childlike in size, but capable of flying with their larger set of wings and smaller bodies. Currently the newbie member of the Drabbuny group. He’s very high energy and has a cheerful disposition. He’s always eager to lend an hand to anyone that might need it, this eagerness to please and be of service can sometimes backfire however when others take advantage of his trusting nature and naivety, or if Kiuwi is simply too enthusiastic and makes common mistakes. He’s gregarious and sociable, always looking to meet new people and find new friends. He loves nature and has a way with wildlife. Others often comment on his green coat as it tends to be uncommon amongst his kind. Acts as the accountant and money man of the group, handling the business end of things. Highly conscientious and orderly, he keeps things running smoothly for everyone. He has a very dry and straight forward personality, which makes him a bit hard to read on occasion. He keeps the books balanced and takes care of the group’s finances when needed. He’s not exactly athletic, but he makes up for it with his ample intellect. As one of the more introverted members of the group, he can be found with his nose in books or busying himself with his own work and research. Time is money! These two are brothers. They are almost always found together, and are often hard to separate, as they are very protective of one another, and while he is very good natured and affable, he takes his brother’s safety very seriously, so don’t mess with him! The oldest brother Urengii who has an orange coat of fur, is seen as the more outgoing and humorous of the two, often playing tricks on his fellow furry teammates, quite the jokester. He’s just as athletic as Burubii and can usually muster up enough energy and strength to help with the work load and help the team if he’s not busy poking fun at others, engaging with his brother, or whatever else distracts him. His attention span can be a bit short sometimes. The younger brother Cherui, who has a light red fur coat, is nearly a complete polar opposite of his sibling, as he tends to be very shy and soft spoken. He often ends up being the calming, reasonable, rational counterbalance to Urengii’s manic energy, a voice of reason. He’s particularly known for his incredibly good cooking skills which can take those who don’t know him by surprise. Needless to say, he takes on all of the food prep and cooking duties for the group, somebody’s gotta do it right? While very different in temperament, he’s very attached to his older brother and looks up to him, admiring his sometimes overzealous zest for life, but at the same time he feels that he can be a bit over protective.